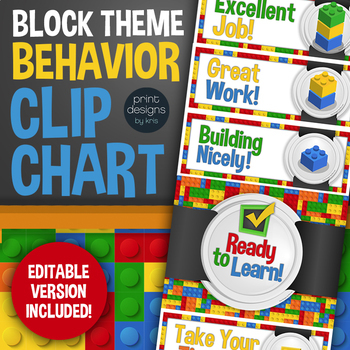 Complete your lego block themed classroom with this behavior clip chart. 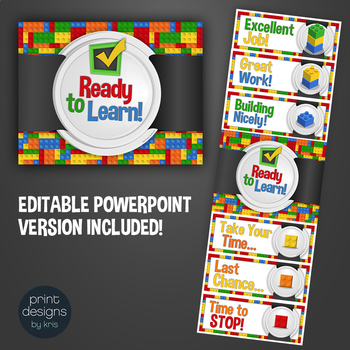 Part of the huge LEGO Theme Classroom Decor Bundle! • Editable PowerPoint file if you prefer to fill in your own text! If you go to your My Purchases page, beside each purchase you will see a Provide Feedback button. Simply click it and give a quick rating and leave a short comment for the product. For every time you give feedback, TpT gives you feedback credits that you use to lower the cost of your future purchases! Win win! Be the first to know about my new discounts, freebies and new products by clicking the FOLLOW button next to the header in my store. Stay in Touch for special discounts and giveaways! Like me on FACEBOOK for exclusive access to FREEBIES and GIVEAWAYS! Follow me on INSTAGRAM to get a behind the scenes look at the creative process! Check out my PINTEREST to see what resources I am pinning! Check out my WEBSITE for other design products such as birthday chalkboards and greeting cards!